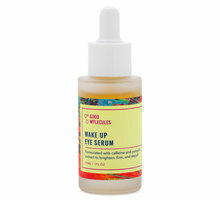 Let’s talk about packaging. Perfume packaging, that is. Perfume bottle design is an art—and a trip to the fragrance counter can feel like a visit to a mini-sculpture garden. With so many designs out there, from hand-painted glass decanters to Art Deco moulded figurines with bakelite stoppers, it’s no surprise that collecting fragrance bottles has become a popular hobby. You can see the essence of each passing decade reflected in every distinctive bottle. Follow us as we take a look back at a century’s worth of genius (and sometimes garish!) bottle design. 1900s–1910s: When Art Nouveau was at its peak in the first decade of the century, perfume bottles were whimsical, floral, and ladylike—as in L.T. Piver's Floramye from 1905. Crystal was a common material for bottles at this time. Adorned with gold lettering and brass caps, they were often corked with stoppers that acted as wands for applying fragrance to one’s wrists and neck. In 1907, the first perfume atomizers emerged. 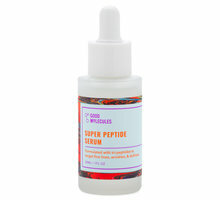 Dubbed “perfumizers,” they delivered liquid fragrance in a fine spray. From this invention, as manufacturers started creating empty decorative bottles with attached bulb atomizers, a new industry was born. A proper lady was encouraged to store her favorite fragrance in an atomizer bottle in order to get the most out it (like today, the stuff back then was typically expensive!). 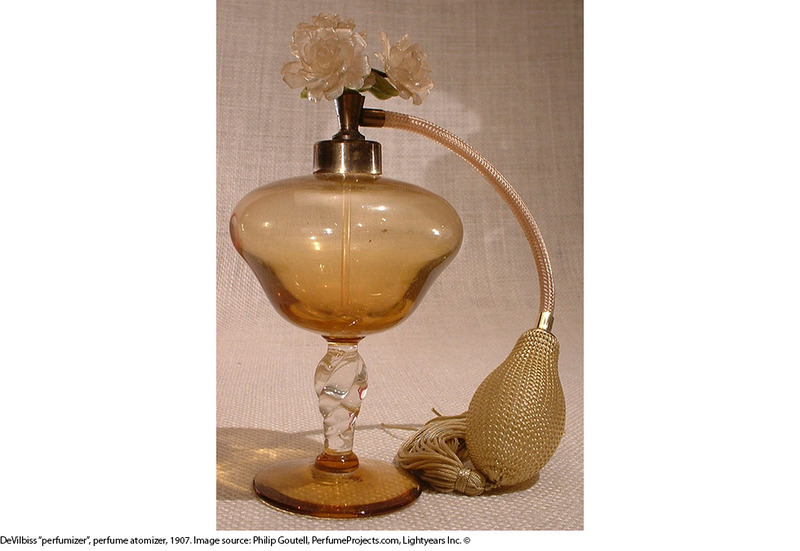 One popular perfumizer that released around 1907 was DeVilbiss, a curvaceous bottle topped with glass flowers When such intricately shaped bottles—resembling everything from plant arrangements to women's shoes—started to appear, some believed that the emergence of modern psychology (which also happened in the early 1900s) had something to do with it. 1920: Surprisingly, some attribute the demand for perfume in America to World War I, as soldiers brought back fragrances from overseas to their sweethearts. The expansion of perfume sales in the United States brought about new fragrance companies, collaborations with fashion designers, and of course, new bottle designs. Meanwhile, many perfumers’ luxurious bottle designs started to reflect the rising success and glamour of Hollywood. As taste became more cosmopolitan, the floral motifs and whimsical packaging of earlier eras was ditched for an Art Deco aesthetic and more urban-inspired designs. Lentheric's Miracle (1924), A. Euziere's Atakor (1925), and three 1920s fragrances from Jean Patou (Le Sien, Amour-Amour, and Que Sais-Je) all embody this era. Though elaborate bottle designs proved to be the most popular throughout the ’20s, the scent that stood the test of time was Chanel No.5, which was bottled in a simple rectangular vessel with a glass stopper and paper label. The straightforward design reflected the fuss-free, go-get ‘em nature of the revolutionary Coco Chanel. 1930: When the Great Depression hit, perfume sales dipped like never before. Many manufacturers, even those abroad, were forced to shut down, and this put a temporary end to fanciful bottles. The intricate, handmade containers seen in previous decades gave way to cheaper machine-made bottles. Some perfume houses cheated around the appearance of these more inexpensive bottles by encasing them inside eye-catching outer packaging: these Coty fragrances from the '30s came tucked into boxes with glass-slipper high heels. 1940: As WW2 came to a close in the mid-’40s, there was a resurgence of creative fragrance bottle design, but with a kind of uniformity not seen in previous decades. The war had brought an untimely end to the glass blowing industry, but the public’s desire for perfume in artistic bottles was growing. Perfumeries answered the demand by creating elaborately-shaped moulds which allowed fanciful bottles to be mass produced by machines. 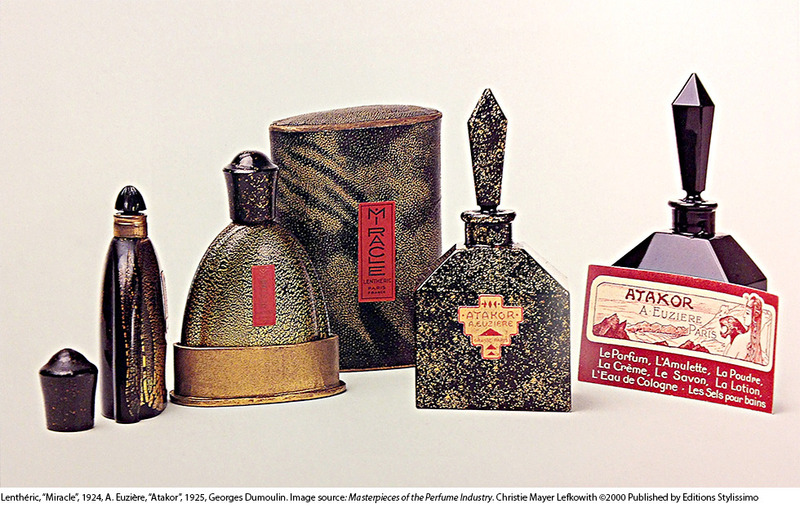 It became common to see the same artistic bottle designs released from several different companies, who would then personalize the vessel with paint and enamel as well as metal or plastic attachments to distinguish one fragrance from another. 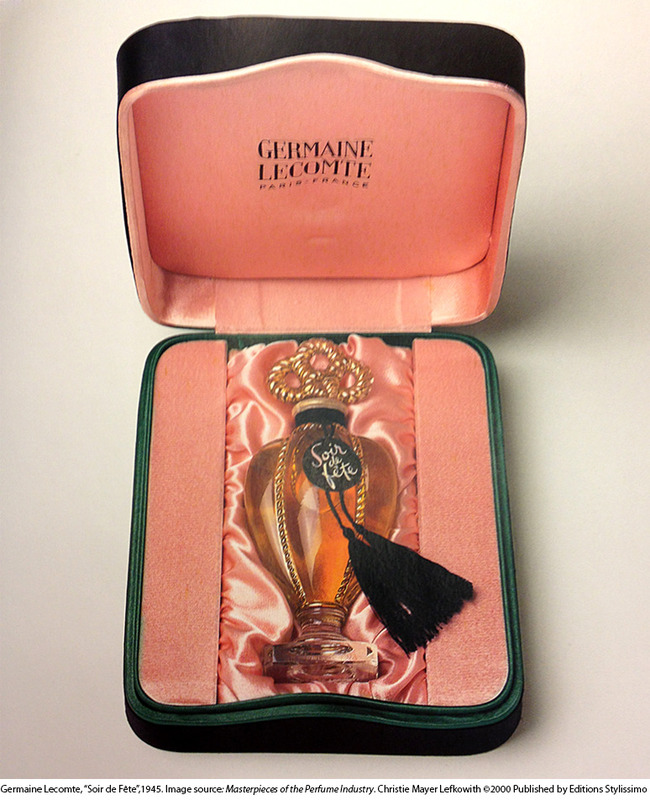 Germaine Lecomte's Soir de Fête, for instance, was fairly standard in terms of the bottle shape, but the metallic embellishments and satin-lined box gave it a decadent feel. 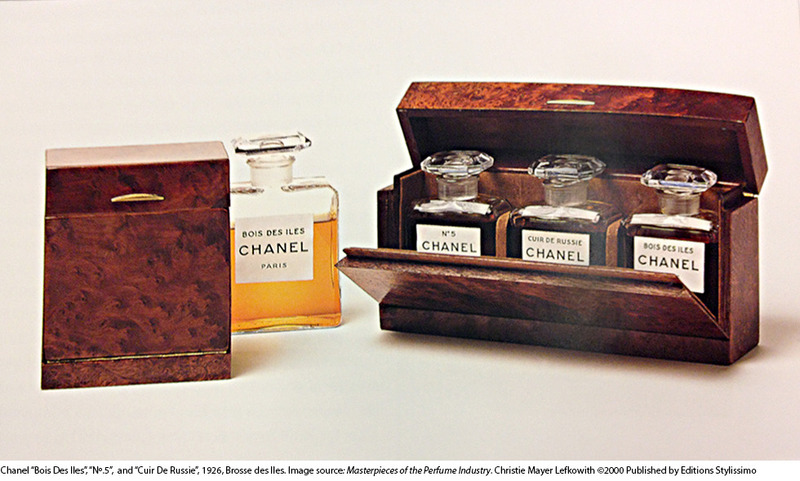 1950: As modern art movements like Abstract Expressionism and Surrealism began to ease their way into the mainstream, artists found worthy patrons in the world of fragrance. Most notable was Salvador Dali, who designed bottles for fashion designer Elsa Schiaparelli as well as the fragrance company Marquay. For Marquay, Dali went with an abstract black and red punk motif with a bold contrasting tape-like label for the brand’s “Rock ‘N Roll” fragrance—a concept way ahead of its time. For Schiaparelli's Le Roy Soleil, Dali’s vision was a golden sunset, complete with painted birds arranged in the shape of a face. The artist had actually been inspiring Schiaparelli for decades. When the label had released an elaborate bust-shaped fragrance nearly 20 years earlier, there was a Dali-designed crown of flowers in place of a head. 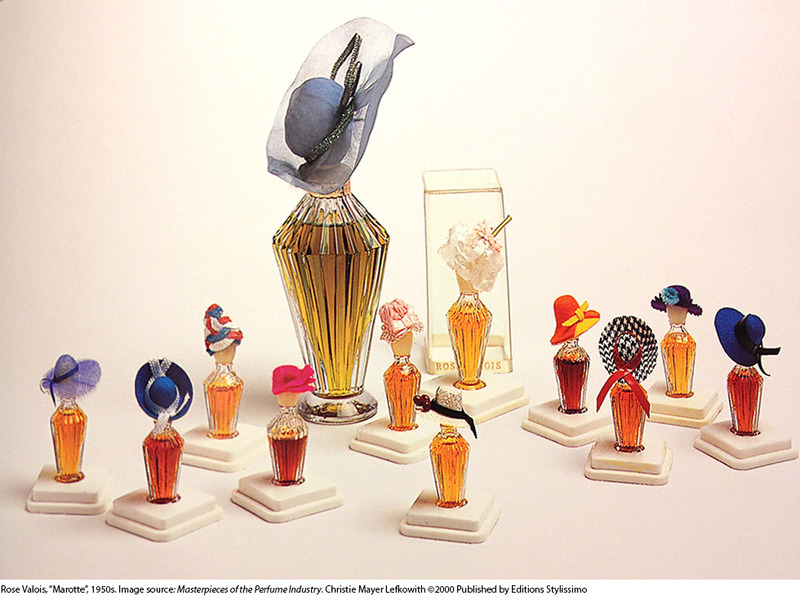 The artist-designed perfume bottle was adopted by many companies during this time, Dior and Lancôme among them. Other artisans got in on the action, too: hat maker Rose Valois designed a set of miniature bottles for Marotte, each topped with a different top hat. 1960: In the ’60s, as a part of the decade’s return to craftsmanship and folk art, handcrafted artisans and independent glass-blowing studios began to proliferate. The movement led to some highly decorative and distinctive bottles, often inspired by fashion of the decade (think angular shapes and bright colors). Even the gigantic makeup enterprise Avon got in on the act, releasing 10 different fragrances, each one with its own unique bottle shape and color. 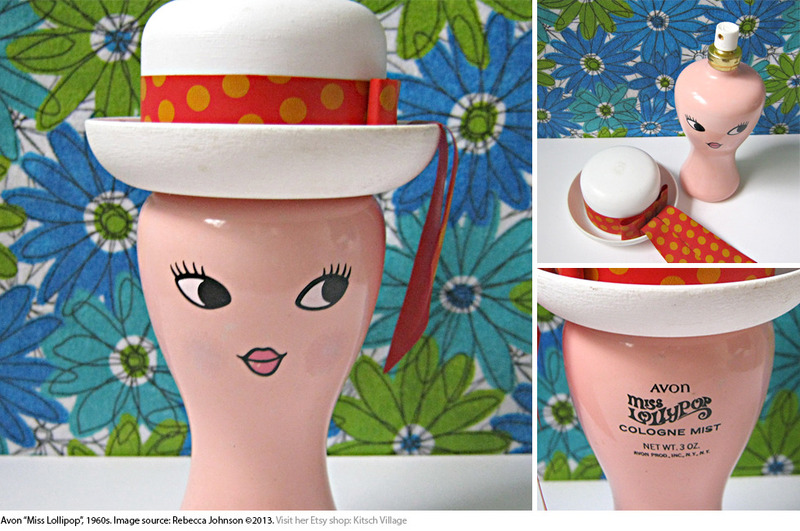 Our favorite: a curvaceous, pastel pink vessel with a hand-painted face for a scent called “Miss Lollipop”—search Etsy or eBay and you’ll find it for sale. 1970: The ’70s woman was seen as strong and independent, and her fragrance was there to fuel the fire—this is also the era in which musks started to gain popularity (see Houbigant's Musk). The re-introduction of metal into women’s perfume bottle designs made them more feel more unisex and utilitarian: stoppers were sometimes replaced with screw tops, allowing fragrance to be applied with a splash rather than a dainty dab. The pared-down designs signaled to the consumer that a liberated, modern women could fit luxury into her busy schedule. 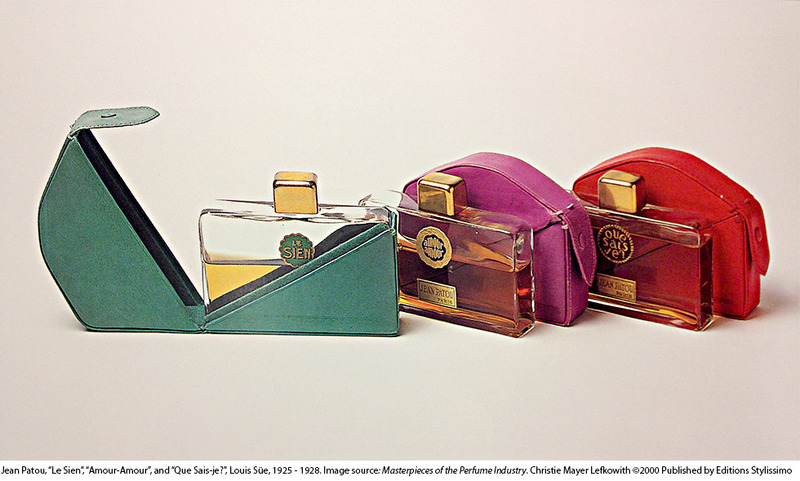 1980: This ’80s introduced a revolutionary concept in the fragrance world: perfume as a toiletry item. 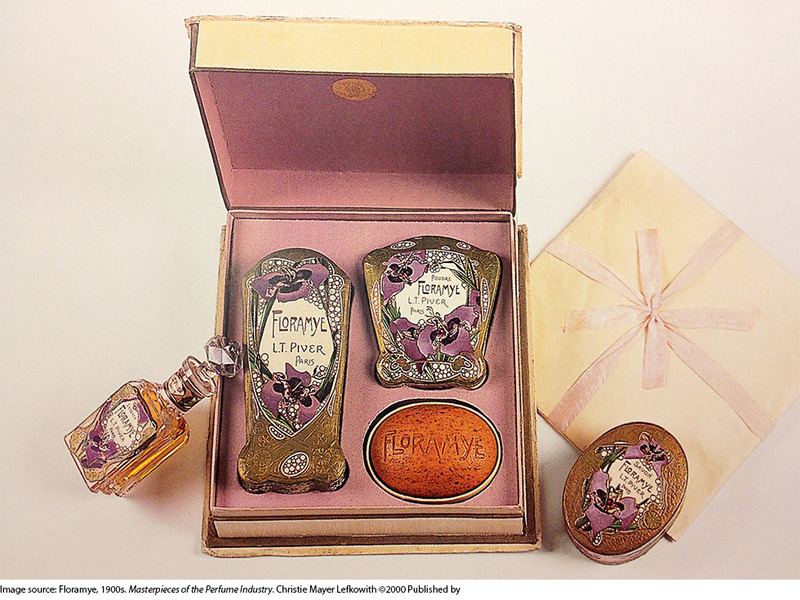 With the introduction of the built-in atomizer (the kind you see on nearly every perfume on the market today), perfume became truly portable for the first time. 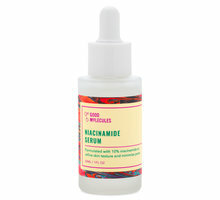 You could carry it right along with your lipstick to work and in your purse. 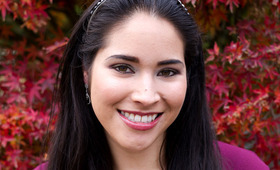 Plastics became more commonly used in bottle design, too, which made perfume available to a wider variety of customers. 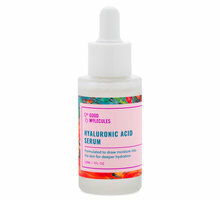 Of course, this is the ’80s we’re talking about; gaudiness wasn’t off the table in terms of packaging design. Bottles got more grandiose, in heavy clear or black glass geometric shapes, gold metallic lids, and other flashy details. Dior's Poison was one example, arriving on shelves in 1985 in a deep plum, round glass apothecary bottle with a crystal stopper. 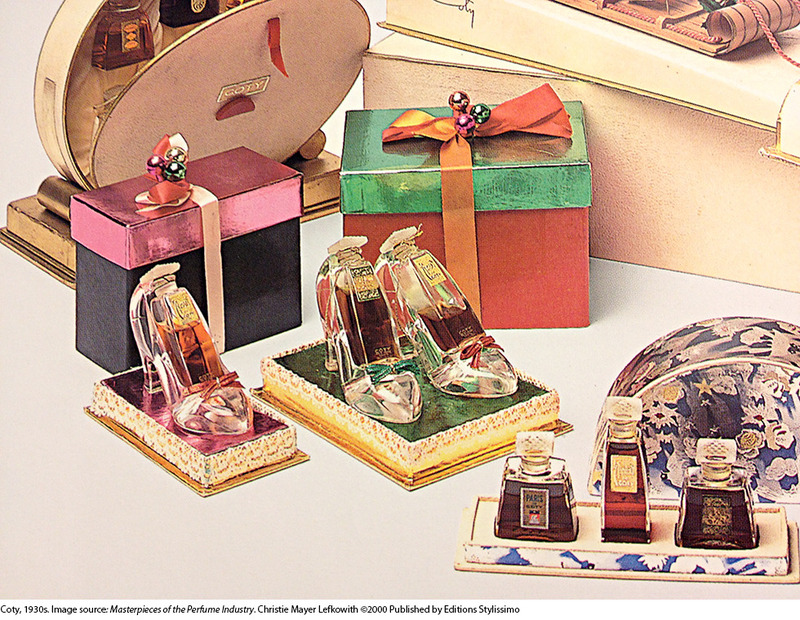 1990: By the mid-’90s, with the rise of outsourcing, few bottles were still made in the U.S. Because labor and packaging became cheaper, the price of perfume dipped as well. 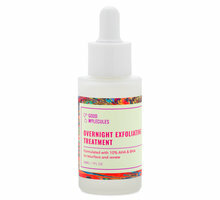 Even high-ticket fragrances were sold in drugstores alongside cheap duplicates in bottles of glass, tin, and plastic. The era’s inexpensive construction meant that, for the first time, perfume bottles were disposable. 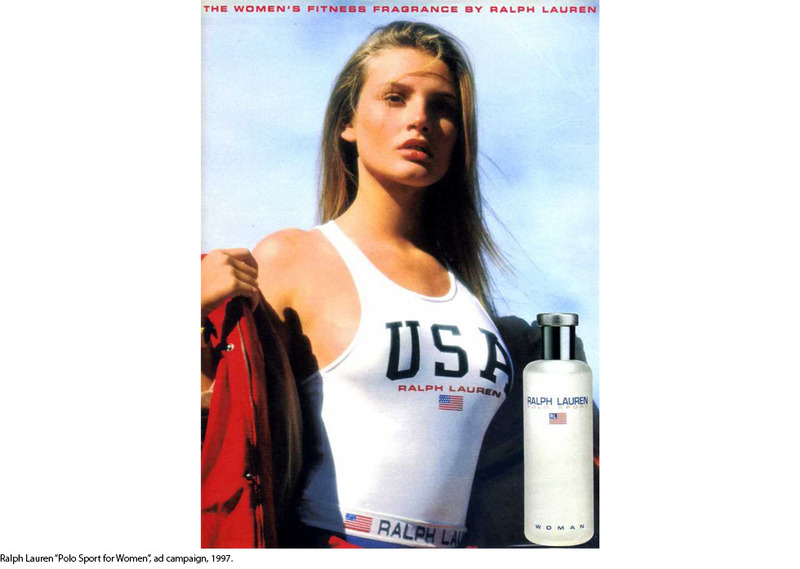 Designer scent packaging began to resemble other toiletries—Ralph Lauren’s “Polo Sport,” for instance—looked more like a shampoo than a fragrance. Today: With affordable labor and materials like color-coated glass and lightweight plastics readily available, perfumers are testing the limits of bottle design. You can find abstract glass, metal, plastic, and even wood vessels hold every scent imaginable, in every shape and size. 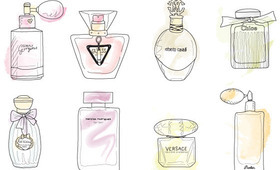 There are more celebrity and fashion designer fragrances on the market now than ever before, and it’s common now for perfumes to have complex and bold features. 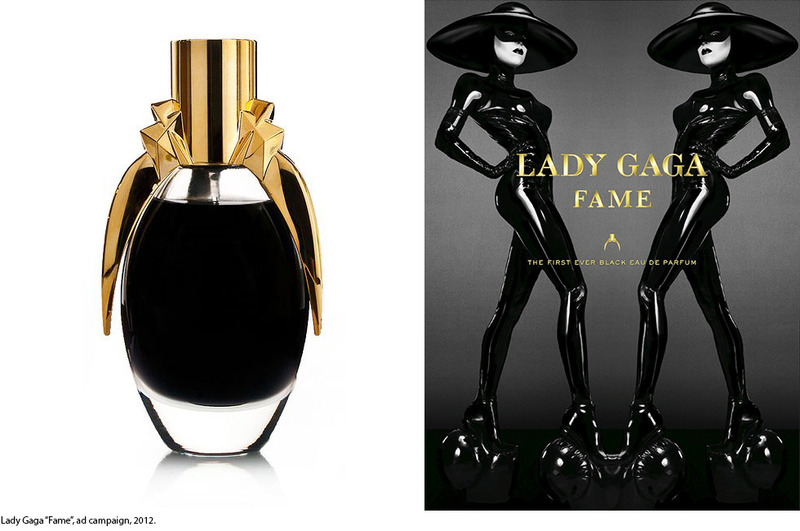 For example, Lady Gaga’s “Fame” made headlines for its oval bottle with a gold, scarab-shaped lid; the black perfume inside becomes clear once sprayed. Nicki Minaj took it even further with Pink Friday in a bottle shaped like who else: herself! It’s clear that bottle design is just as necessary to fragrance sales as it was 100 years ago. We can only imagine what we’ll be seeing (and smelling) next. Here’s to the next hundred years! Want to Make the Switch to Natural Deodorant? Read This. Sean "Diddy" Combs Announces Face of "Empress"